Ordinary Life Magic: march 18: eggzactly. Our Spring holiday is coming up in a few days. 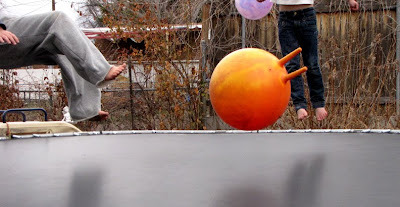 Though we sort of pretended we live on the southern side this year, and have pretty much been thinking and celebrating Spring since March 1st (what else were we to do while enjoying sunshine and friendly temperatures? ), the Equinox will make it undeniably official. Well - that's not quite right... we're celebrating with the usual things we celebrate with, and have invited a couple of friends to come and play, too. A small keg. :) We're awfully fond of gourmet microbrew at my house. Jelly beans. A bonfire. An egg hunt. Our spring baskets will be filled that morning with lots of pretty treasures - sidewalk chalk, shorts, new swimming suits, eggs with surprises, kites... you know. So we're getting pretty serious about gettin' ready! And - perhaps the best of all - Chocolate Peanut Butter Eggs. There is a story behind these eggs, and so I shall be doing the telling of it. And Thank you, Aunt Kathy. 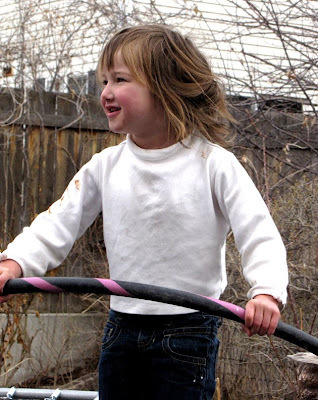 Hoops, crawling, bouncing, leaping, slitherin', loving, laughing games. Ice cream to the babies while mama sits and catches up with the day for a minute. Yes. Yes. Yes, thinks the Mama. This is the life I am meant to live. In memory, in reminiscence, in love, in joy, in games, in creating, in contemplation (even if it's the satisfaction of pondering and planning Dinner at 2:50 in the afternoon), in a wafting spring breeze, in a laundry basket, in a rhythmic, joyful squeak of trampoline springs -and giggles- that flow in from the thrown-open back door, in honoring, in posterity, in Presence. This is my Greatest Life. Oh. And she even bows her head. Oh, she continues, Thank you! and the woolen eggs are brought in. The babes continue to play. And the makings of dinner. And... popcorn and a movie? and prob'ly we'll see you tomorrow. I know of no more season more welcome or deserving of a grand party than Spring! 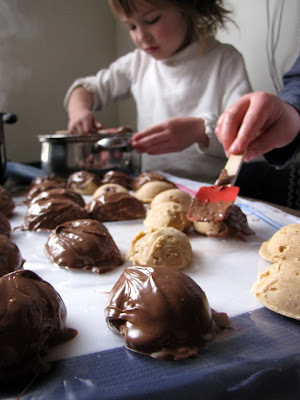 Those peanut butter chocolate egg creations look amazing. Happy , happy holiday to you and your incredible family! Beautiful projects you all created together. 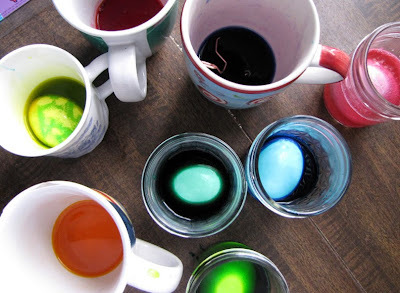 I answered your question about the brown eggs on my blog--- we did use brown eggs, our food coloring is brighter than the normal kind, it's called Neon Colors, or something. I added the link in my post. Thanks for bringing that up! It's all good - can't wait to hear more about the chocolate eggs - they look delish! A party! Have a fantastic time. Love seeing all the preparations. 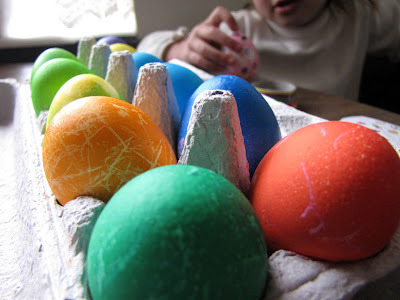 Such beautiful vibrant coloured eggs too. Happy Spring. It is so good Spring is coming along slowly. 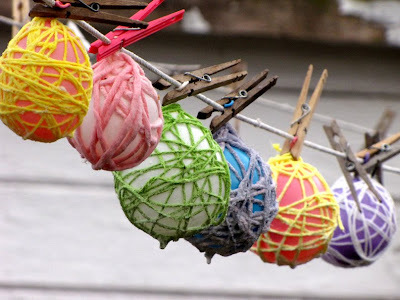 Love the yarn eggs! We're going to have to try our hand at making those. And the peanut butter eggs look delish! Have a wonderful time celebrating spring this weekend! Those chocolate PB eggs have me drooling here! Can't wait for the story. 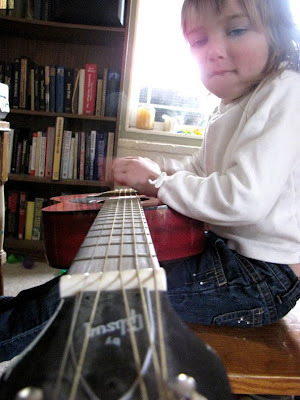 I love all the ideas you have packed into this one post. Love the yarn eggs. Love the pb eggs. Hope your cold front moved out for today! Cute wee eggs. Such a problem with the whole Easter/spring thing down under when it's Autumn yet the eggs symbolise spring! lol. (not to mention my 's' usage hehe). Love that you went with the 1st March thing for beginning of spring! I've finally accepted Autumn now (which is fine, coz I love autumn). Oh those eggs!! so much fun!